This photo was taken on the street of Boyle Heights. The sign is located on top of the Monarca bakery shop. Many already know what gentrification is but not many have heard of gentefication. Gentefication is when “gente”, meaning “people” in Spanish, typically second-generation, invest in their old neighborhood. In other words, it’s when college-educated Latinos open or invest in a shop that includes Latino culture but also reflects a more American taste in order to attract a more diverse crowd. Having these types of businesses help the community and neighborhood stick to their culture and prevent more affluent outsiders from invading. It also helps in not raising the rent around the neighborhood. Gentefication is the way to go. On the flipside, if we let gentrifiers in our community, all of our culture and history can potentially disappear from our neighborhoods. If gentrification takes over our community, our neighborhoods will be filled with art galleries and apartments, which isn’t necessarily all that negative as it will raise property values, but it will also raise everyone’s rent. Gentrification also harms “mom-and-pop” stores by replacing them with big chain stores. Having some of these new businesses can be useful but it also destroys our culture and a part of history. If we can allow more gentefication, our community will still be able to keep our culture and history. Having a native gentefier is a big help because they understand what their community needs and doesn’t need. Gentrifiers put big chain stores wherever they can so that their business can grow, they don’t think about what the community needs. For example, take art galleries, our community doesn’t need art galleries. If we wanted one, we would have displayed art from our culture, something that relates to our community. 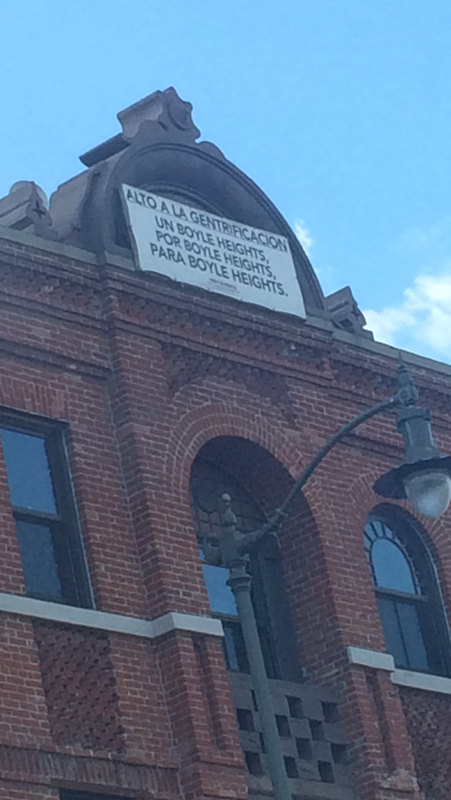 Places like Boyle Heights need more gentefiers than gentrifiers. They need people who know about their community and knows what’s best or what they need. Let’s advocate for gentefiers, not gentrifiers. You really don’t have a choice as to who buys in your community, just as those who came before you did not have a choice. And, when people did not have a choice, we called that DISCRIMINATION. So, don’t even go there — it’s a history you do not want to repeat. If wealthy people move into a neighborhood and displace lower income people, that is gentrification. You made the mistaken assumption that it’s okay as long as those moving in are the same race or ethnic background. I’m at a loss as to how gentrification harms those who remain in the neighborhood. Wealthy people bring improvements — including increased purchase prices for homes — all of which are owned by “poor people”. Those “poor people” who remain in the neighborhood benefit from all of this improvement. How do they benefit when they can no longer afford to stay there?